Coming so soon after events in Orlando one cannot but wonder if Duke’s appearance on the cover of Attitude hasn’t somehow been coordinated. First we have an attack on gays supposedly carried out by a lone Muslim extremist, whose father was a CIA asset, and which looks increasingly like a staged false flag. Now, days later, the heir apparent to the British throne is telling gays that “no one should be bullied for their sexuality”. “You should be proud of the person you are and you have nothing to be ashamed of,” Prince William told a delegation from the LGBT community he had invited to Kensington Palace. Of course, it goes without saying that no one should be bullied. However, saying people should be proud of what they are goes beyond that. The fact that the initiative for this invitation came from the prince, or more likely his “advisors”, is suspicious. All the more so as this occurred days after events in Orlando. Call me a conspiracy theorist but this looks suspiciously like a ‘good cop, bad cop’ routine. With Omar Mateen the symbolic ‘bad cop’ and Prince William playing the part of the ‘bad cop’. Telling the LGBT community, in effect, that it’s OK to be gay or whatever else they are. Ed. The Duke of Cambridge has appeared on the cover of the UK’s leading gay magazine, Attitude, as he spoke out against homophobic bullying. The Duke revealed on Tuesday he would be appearing in Attitude after signing a book of condolence for victims of the gay nightclub shooting in Orlando which left 49 people dead and dozens of others wounded. He had invited the magazine to bring members of the LGBT+ community to Kensington Palace in May to listen to their experience of bullying and the mental health affects it can have. “No one should be bullied for their sexuality or any other reason and no one should have to put up with the kind of hate that these young people have endured in their lives,” he said. Attitude editor Matthew Todd, who led the meeting with William at Kensington Palace, welcomed the Duke’s support. “During my time as editor of Attitude I have met parents whose child has taken or lost their life after being bullied for being LGBT+ or even just perceived to be LGBT,” he said. 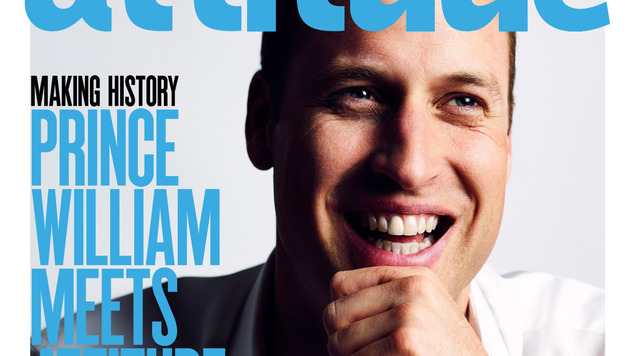 The colour cover shot, taken by Australian-born, London-based celebrity portrait and men’s fashion photographer Leigh Keily, shows a relaxed William in an open-necked white shirt, laughing as he rests his chin on his left hand. Nine members of the LGBT+ community told the Duke how being bullied had led to low self-esteem, suicide attempts, eating disorders, depression and drug addiction.